A world of ever-increasing connectivity has brought us lightning-fast Internet speed, easy-access virtual networks, and the ability to communicate through instant message, chat rooms and video conferencing with the touch of a keyboard. With this constant (and reliable) connectivity, lines between our work life and personal life are increasingly blurry. For many, this has been a boon—allowing more and more people to work from home. 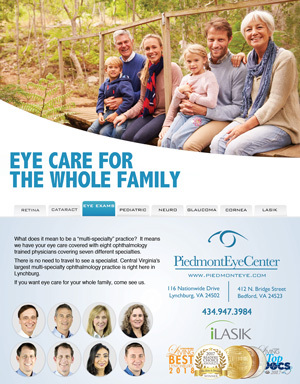 This has shaped not only the way we interact with our friends and family but how we are able to work—whether that’s a full-time job, a part-time gig, being a student or keeping our households running smoothly. 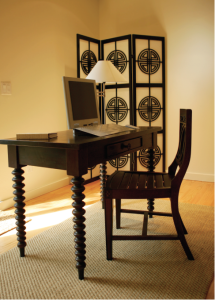 But it has also forced many of us to re-think our physical workspace within the home. If you want to keep organized, ensure your tables are not overrun with stacks of paper, ban computers from monopolizing your dining room table, and generally keep your home looking like a home, consider creating one or more home office workspaces. Every home office has few basic requirements. You’ll need a computer, naturally. If you are a full-time telecommuter your company will likely provide you with a laptop, but bear in mind that any personal work you do on that computer will be track-able. If you are a full- or part-time freelancer, a homemaker, or a student, you’ll need to buy your own, and that could be a laptop or desktop, depending on the work you do. If you are just looking to keep your household organized, including paying bills online or taking advantage of online ordering to cut down on shopping time, speed and portability may not be an issue. In which case, purchase what you can afford and just what you need. Computers should all be wifi-enabled. Along with a good computer is the need for good Internet connection. Whether that’s through your phone company or your cable TV provider, invest in the fastest and most convenient connectivity you can afford. If your company is paying, even better. But your house should be set up for wireless Internet service, allowing you to place computers anywhere in the house without cords. A home office should also have a printer, scanner, fax and copier. You can usually buy a 4-in-1 combo of these machines, very compact, for very low cost. As much as we all would like to go 100 percent paperless, there always seems to be a need to print something. And while smartphone apps let you scan and email or fax documents, for a true office environment, you may need to invest in an additional piece of hardware to print. With the basics in hand, it’s time to design your perfect workspace, which will vary depending on your needs. According to Forbes magazine, in 1995, only one in 10 employees worked from home. A mere 20 years later, that number jumped to four in 10. If your company allows full-time working from home, the benefits can be significant. You can save time and money on driving and commuting. That extra time often allows for the ability to run errands and do household chores while still putting in a full day’s work, which in turn leaves more genuine free time on weekends. The caveat is, you need to be 100 percent as productive at home as you would in an office. For many, this means not only getting into the mindset of working from home (self-discipline, adjusting to lack of social contact) but it also means investing in the right setup. If you work at home full-time, the most ideal situation would include a room dedicated to being a home office, with a door that closes. Think of it as a private office in a regular work setting. It’s your space, designed for maximum privacy and organization, and you report to work there, just like you would in a normal office. It helps with creating the right mindset—and has the practical benefits of privacy and quiet, allowing you to keep household noises from intruding on your work area. With this in mind, however, don’t limit yourself to the furniture section of your local office supply store. It’s still a room in your home. There’s no need for industrial metal file cabinets and Formica desks. The benefit of working from home is choosing your own decor so, when your door is open, it flows organically with the rest of your home. Desks can be repurposed dining room tables. File cabinets can be credenzas or buffet tables, or decorative shelves with baskets for drawers. 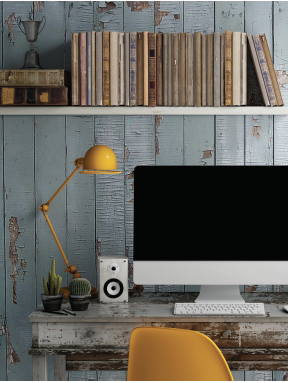 Creating a home office can also be a good excuse for a broader home refresh. See if you can repurpose underused furniture you already have, helping open up space throughout your home. Or, replace the repurposed furniture with some upgrades. And of course, you can paint your walls however you like, and include beautiful window treatments—neither of which you are likely to enjoy if reporting for work in a traditional office building. You may opt to keep colors calm and relaxing, conducive to concentrating. Or you may want something brighter and more lively, to keep your energy levels high. Choose a color that works for you, and that complements the rest of your home. You should also invest in quality window treatments that allow you to adjust for changing light throughout the day. The only piece of furniture you might need to invest in that might not match your decor as well as you would like is a good, ergonomic chair. If your work requires you to spend hours sitting in front of a computer screen, you may want to invest in something that is good for your back. (There are also higher “standing” desks or desks with tops that can be raised, to allow for changing from sitting to standing positions.) Consider the length of time you’ll be at the computer and buy ergonomic furniture where it makes sense for your comfort and well-being. You may also need to consider the unsightly but practical plastic protective cover for your floor or carpet, to prevent your office chair from scratching or wearing down flooring. If you are lucky enough to be able to fully dedicate a room to office space, wonderful. However, there’s no reason your office can’t serve a second purpose as a guest room on weekends. If space and budget allow, invest in a Murphy bed with built-in shelving or a comfortable pullout couch. During the workday, these pieces can serve as office furniture. During the weekend, they allow for use as a guest room for friends and family. 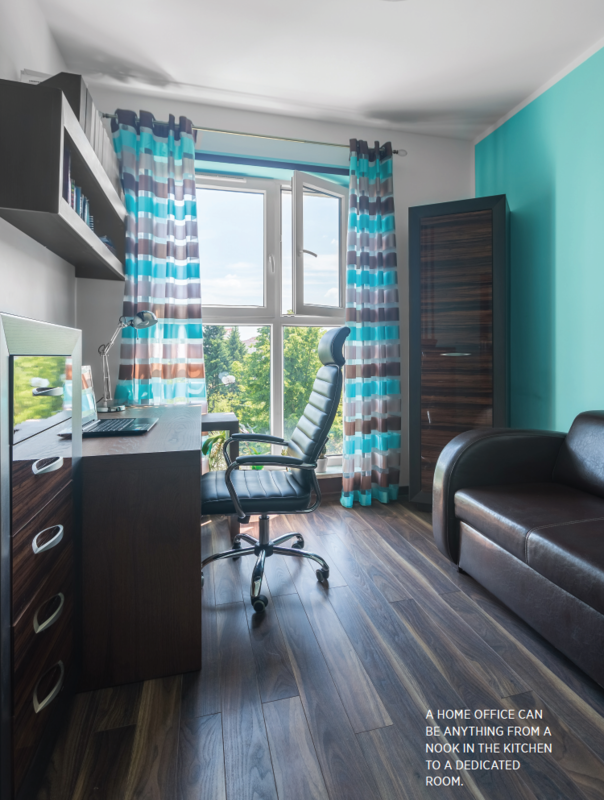 For students, those who work part-time from home, or household managers who need to address a monthly wave of bills or a daily deluge of school forms, you also need to allocate time and thought into setting up a home office space. If you’re studying or generating income, you want to ensure you can continue to work effectively from home. And if you are managing bills and paperwork for home, you’ll need to stay organized. However if you don’t have the space—even as a full-time telecommuting employee—you just need to be a little more creative. Your challenge in these cases might be more about being able to hide your space (and clutter) while still being able to work effectively. You’ll likely have to file paperwork, invoices and the like, and you won’t want that to overwhelm your living space. If you have limited space, revisit the type of computer you want to get. A desktop is harder to conceal than a laptop, so the smaller, portable option might be your best bet. However, if you do graphic design or other work that requires a large monitor, a laptop won’t usually work. Thankfully, there are many creative ways to carve out space. One of the more popular trends is renovating a closet into a small, compact office—a “cloffice.” Try to choose a closet in a well-lit area. Remove the clothing or other stored items and redistribute to other closets and cabinets. Install a small, narrow desk, or create one with brackets and a sturdy shelf. You can even add a slide-out shelf for a keyboard or laptop. Add shelving to the interior walls—vertically, to maximize space—and voila! You have an efficient space that allows you to close the doors and hide the office easily. If you have a nook that doesn’t currently have doors, consider installing pocket doors or sliding barn doors for an even sleeker space. Get creative with your cubbyhole offices, including upcycling furniture. 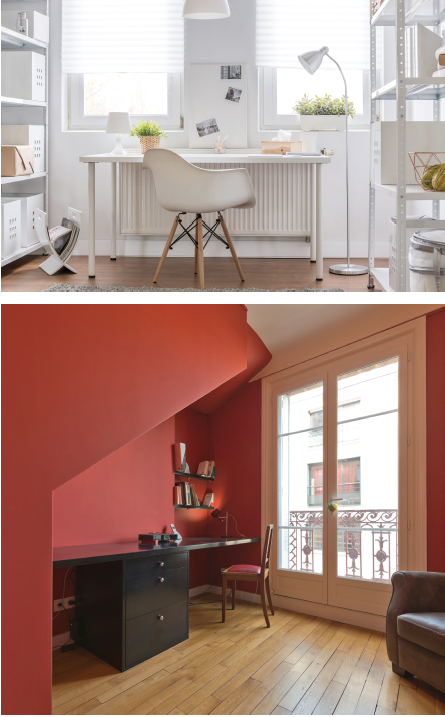 You can also paint the interiors in bright colors to create lighter space. If you lack extra closet space but have more funds, consider working with custom carpenters to carve out spaces under staircases, or build out a closet in a larger room using drywall, sliding doors and shelving. Challenges in these configurations will be electricity and lighting, unless your closet has a plug or a light already installed. Use the nearest exterior plug and an extension cord or power strip, then remove and stash when not at work. Also, here’s where the wireless connectivity becomes a benefit. A wifi-enabled laptop, desktop and printer in these spaces will make for more efficient use of space without cords and wires everywhere. If you don’t have a room to spare, and absolutely can’t spare a closet, no worries. You can create a corner or a nook in an existing room (again, look to your guest room or den first…see if you can make them do double-duty). Set up a sleek desk and shelves that match your decor, and hide files and paperwork in baskets or other decorative storage containers. If you have a laptop and only minimal paperwork or files, a vintage “secretary” desk might be a decorative and practical option. Another great piece of furniture is a computer cabinet that has a slide out shelf for your keyboard or laptop, and shelves and platforms for your printer and other computer accessories. When done working, you close the doors, and it just looks like a stand-alone wardrobe or TV cabinet. They can be bulky, but they are practical, keep your house neat, and can be moved around as needed. These can be placed in living rooms and family areas or in guest rooms or bedrooms. For even more compact spaces, where you don’t even have room for a desk, you can purchase or create your own “Murphy tables” that fold up when not in use. These work best for people who have a laptop they can stash elsewhere when not in use and who can put paperwork in other sections of the house. And with wifi, you can even stash your printer in a completely different space of the house, like a laundry room or basement, and print remotely. For offices where you don’t have dedicated space, you should still pay attention to your chair and your flooring. Even a basic chair can be made more ergonomically sound with proper cushions and back support. And get a small roll-up rug to protect flooring. 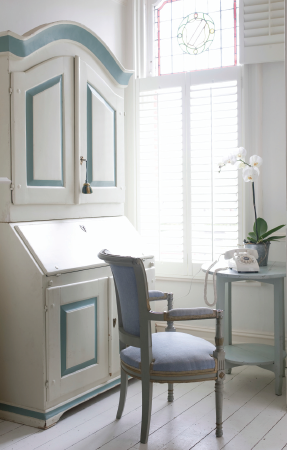 A home office can be anything from a nook in the kitchen to a dedicated room. And for households where there are dual telecommuters, and students too, you should be able to create more than one space to accommodate everyone’s needs. The effort to invest in these spaces will lead to more efficient work-time, a more organized home, and a more relaxed you.